Spa Jazz finished 2nd in his 1 Mile Race at Gulfstream Park on February 17th in his final race for Sackatoga Stable. He was claimed for $6,250 and ended his Sackatoga Stable career with one win, one 2nd, one 3rd in 11 races with earnings of $34,815. Niko’s Dream finished a fast closing second beaten by a neck in her race on October 24th at Belmont Park. She received a 54 Beyer speed figure for the race and earned $12,400 in purse money. Frosty Gal placed in her 6 Furlong allowance race at Aqueduct on December 7, 2017. 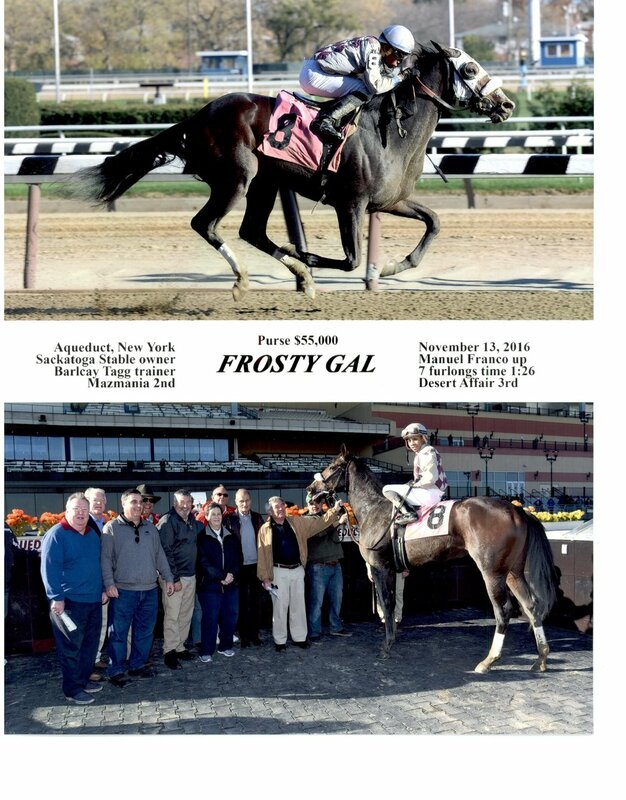 Frosty Gal placed in her 6 1/2 Furlong allowance race at Aqueduct on November 16, 2017. On August 12, 2017 Sackatoga Stable purchased a yearling filly for$90,000 at the Fasig-Tipton NY Bred Yearlings Sale. The Bay filly is by Declaration of War out of the dam Near and Dear. Declaration of War is a multiple Grade 1 winner in Europe and finished third in the 2013 Breeders Cup Classic. He is a son of War Front who was the 2016 #1 North American sire by stakes winners (12%) and has sired 16 Grade 1 winners, 35 Graded stakes winners and 62 stakes winners. Declaration of War's first foals are 2 year olds in 2017. He has had 18 horses run so far with 5 winners including a Graded winner. The filly is a registered New York-bred. Near and Dear was sired by Red Ransom out of the dam Deputy Dear. She is the dam of 5 fools to race, all winners, including Saratoga Snacks that is a multiple stakes winner of $693,500. Following his 6th place finish at Saratoga Race Course, Sackatoga Stable announced the retirement of a sound 4 year old Royal Ekati. With the assistance of the New York Thoroughbred Horsemen's Association (NYTHA) Take the Lead program he was placed with ReRun which will evaluate his appropriate placement for a career after racing. Royal Ekati had 8 starts with earnings of $43,965. Flattermefabulous led wire to wire in winning a 1 1/16 mile truf race at Saratoga Race Course on July 28, 2017. She was claimed for $35,000 by Mathew Schera and will be in the barn of trainer Carlos Martin. She earned purse money of $27,000 in winning her 3rd race for Sackatoga Stable, completing her career with the Stable with earnings of $136,478. In her 7 Furlong turf race in the June 25 Stallion Stakes race at Belmont Park Frosty Gal finished 6th. Frosty Gal won her Maiden race at Aqueduct on November 13, 2016 in her 3rd start as a 2 year old going 7 Furlongs on the Main Track and earning a Beyer speed figure of 59. She earned $33,000 in purse money. Flattermefabulous won her First Level Allowance race at Belmont on September 23, 2016, leading wire-to-wire under jockey Manuel Franco. The 1 1/16 mile race on the inner turf resulted in a winner's purse of $37,200.